Pure Air Customer Solutions from Bio Oxygen. Odour control, air sterilisation and air purification are our core business and we pride ourselves on having a competitive business model. No matter what your air sterilisation/purification need is, we can modify our system to provide a solution. We can provide a solution for your air problem. The Bio-Oxygen clean air process is suitable for any type of building as well as underground car-parks or parking lots. Since the Bio-Oxygen air purifying process cleans and sterilises the air within the building, and also the air exiting the building, it can be applied to virtually any air conditioning unit. Contact the office near you for more information about our products and services. Click below to find out more about our specialist services. We provide medical air solutions for every facet of the medical industry. From sterilisation, airborne disease control to purification and odours. Our pure are system improves health. Food processing plants require specialist air treatment systems. 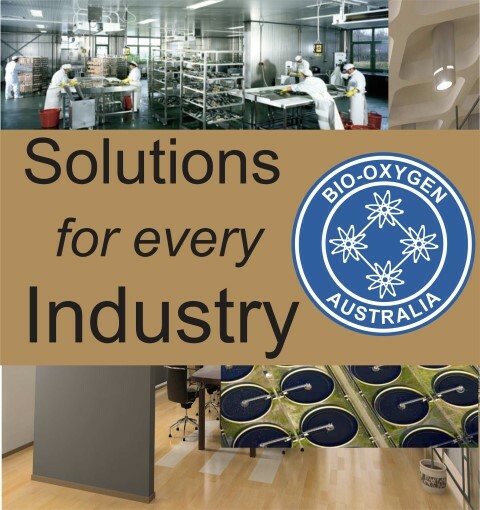 Bio-Oxygen have developed a system which eliminates odours completely to protect the health of workers and community. Commercial kitchen exhaust systems and both internal and external odour control. Compy with local food regulations with our successful pure are system. Sewerage and water treatment plants are vulnerable to foul odours and the subsequent spread of airborne disease from human waste products. Bio-Oxygen have developed a zero odour system to cope.